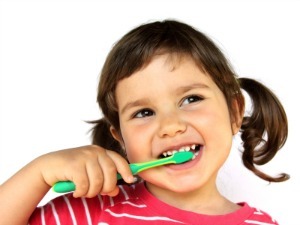 Does you child hate cleaning their teeth? At the end of a busy day, with the winning line of children sleeping just in sight, it can be really frustrating to continually have a battle over doing something so basic. Some of these responses were mine with my daughter. Then I discovered Play and Playfulness. Here are the games I used to help my daughter, Emily, who was 3 at the time, come to actively enjoy cleaning her teeth. I playfully pretended that the toothbrush didn’t know where it was supposed to go. With her pink & sparkly toothbrush, I started gently prodding all over her body while asking light heartedly “Is this what I’m supposed to clean?” touching her cheek, ear, arm, leg, tummy, etc. Lots of laughter. I persisted with being silly pretending that I didn’t know where I (the toothbrush) was supposed to go. Eventually Emily pointed out that I’m meant to go in her mouth and clean her TEETH! She took great delight in showing me / the toothbrush where it was supposed to go – opening her mouth up wide and happily putting the toothbrush inside. I pretended that the tooth brush was terrified of going in her mouth! The toothbrush (me) screeched and protested, saying things like “Noooo, please not in there – it’s soooooo scary – help, help, help!” . Lots & lots of laughter followed. Then Emily moved my hand to get the toothbrush into her mouth which I eventually ‘allowed’ after lots more protests from the toothbrush. Each time, Emily initiated the brush going into her mouth and cleaning her teeth. Both of these games are incredibly effective because they give child the upper hand and they often lead to laughter. The offending toothbrush is silly, foolish and scared which allows the child to become the clever and brave one. When a child gets to play the more powerful role and laughs during this kind of play, that laughter helps them to release some of the fears that come with being a child. For example, fears relating to not having choice or control over what happens or fears linked to not know as much as adults do. The more they laugh, the more fear and stress they release and the more they begin to feel comfortable to cooperate. Now it may seem silly for a child to be scared or overwhelmed by a toothbrush. But cleaning teeth is another example of where children have no choice. They have to clean their teeth (well, if you want them to good have dental hygiene). If they have been resistant to it for a while, their stress has likely accumulated, as has your frustration. The whole thing might have become quite a stressful experience for both of you. Another reason it might be such a struggle, is that their protest about cleaning their teeth could actually be a wider representation of their protest about doing a myriad of other things they have to do. So they focus their frustration and resistance on that activity which may be easier for them to do than for other activities they have no choice about. Usually you are present with them (to make sure they do it), and usually they are tired, so this is the perfect combination for children to try to off load their fears and frustrations. Of course there are times when we just can’t be bothered to be playful. I completely get it! But if you can enter into the silly world of the talking or incompetent toothbrush, you’ll both end up having much more fun, they will be more likely to cooperate and their teeth will be sparkly! Plus, it’s a fun way to reconnect if you’ve both had a busy or stressful day. I’d love to hear if this was helpful for you and how you go with trying some of these games. Let us know in the comments below!